When the hot summer days set in things get tough. I mean it gets really hot. Then again I suppose it depends where you live. But if you are living somewhere where it gets very hot I’m sure you can wait to have a nice refreshing ice-cold drink. And just image it for a moment. Having prepared yourself a nice ice tea (or other kind of beverage) sitting in a comfy chair watching your favorite show or reading your favorite book. It doesn’t get any better than this, now, does it? What is missing is a great nice ice tea pitcher to hold your drink. And they can be used in many ways not just about preparing an iced tea but for making a fruit infused drink or just stepping tea. Just make some ice, pour in the water in the pitcher add your favorite tea (or fruits) add the ice and voila. You have your very own perfect beverage that will keep you nice and chill during those hot summer days. And say, “No, thanks.” to the hot weather outside while sipping your ice-cold drink. This ice tea pitcher is made of Tritan plastic. It looks like a glass and its design is simple yet stylish. The materials are high quality so the pitcher can be continuously used. It can easily be taken on a trip or a picnic. It can easily be washed since it is dishwasher safe. It is also temperature resistant, you can use it in the freezer too. It can be used to hold hot liquids as well. Its size is 64 oz. The pitcher is affordable and good choice if you like to make yourselves drinks and store them for a while in the fridge. The pitcher is made with borosilicate glass, it can withstand high temperatures ranging from 0 and going up to 300 degrees F. It can be used for both cold liquids to really hot ones. The pitcher is made with high quality glass that is durable and can be used for long time. It is also double-annealed making it extra tough. The pitcher has more standard design with a comfortable grip. It comes with filter lid made with 18/8 stainless steel. It is great for keeping ice or the tea in and not spilling over. The mouth of the pitcher is wide and easy to poor beverage. This one is also made with high quality borosilicate glass. It is suitable for holding liquids in different temperatures starting from 0 and going up to 300 degrees F.
It has pretty good capacity of 68 ounces. It has lid and good comfortable handle. There is also filter lid made with stainless steel, great for pouring water or making sure that the ice cubes or tea stays inside the pitcher. The tea pitcher is lightweight, and also dishwasher safe. 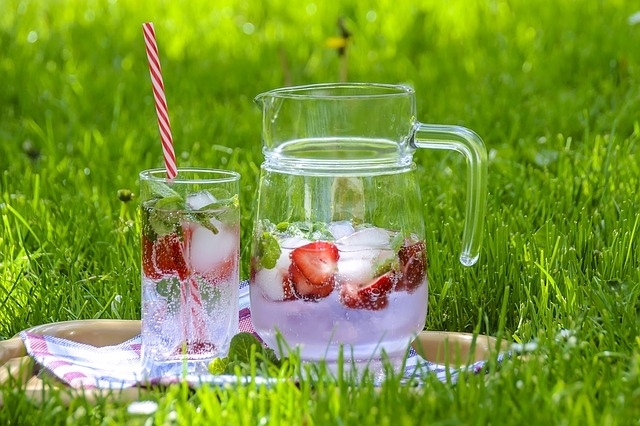 It is very easy to clean and offers good value when looking for something that can be used for preparing iced tea, fruit infused beverages or just a regular water pitcher. This pitcher comes with patented chill technology that allows for quick chilling of the beverages – in 30 seconds. It has standard pitcher design – nothing to flashy or sophisticated. It is good and stylish looking with a comfortable handle. It has airtight and leak proof lid. Great for longer storage of ice tea. It has durable body, and it can hold liquids with different temperatures from cold to hot. It is also made of BPA-Free Tritan plastic. A great pitcher that does the job offering good value at an affordable price. This pitcher is made with BPA-free, shatterproof, and scratch resistant materials. It is also dishwasher safe. Chilling tea with ice core. You can use it for both hot and ice tea. Its size is length 11 3/4″, width 4″, height 11″. It is affordable, good looking pitcher. It allows for easy use and good versatility. Great for anyone that wants to enjoy a good relaxing hot summer day with a cold drink.